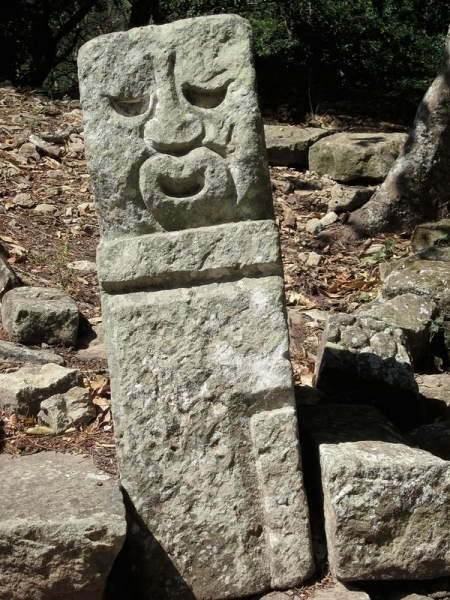 As far as I can tell, Copan Ruinas is “the” Mayan site to visit in Honduras. More generally, one could say it’s also “the” tourist destination in Honduras. 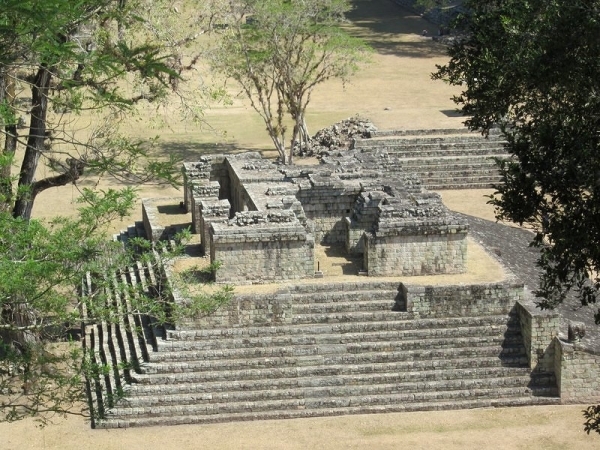 Put another way, if someone has been to Honduras, they’ve probably been to Copan Ruinas. Copan Ruinas is actually the name of a town located in the foothills of Honduras very close to both the El Salvadorian and Guatemalan borders. In our case, getting to the town from El Salvador was most easily done by crossing first into Guatemala. 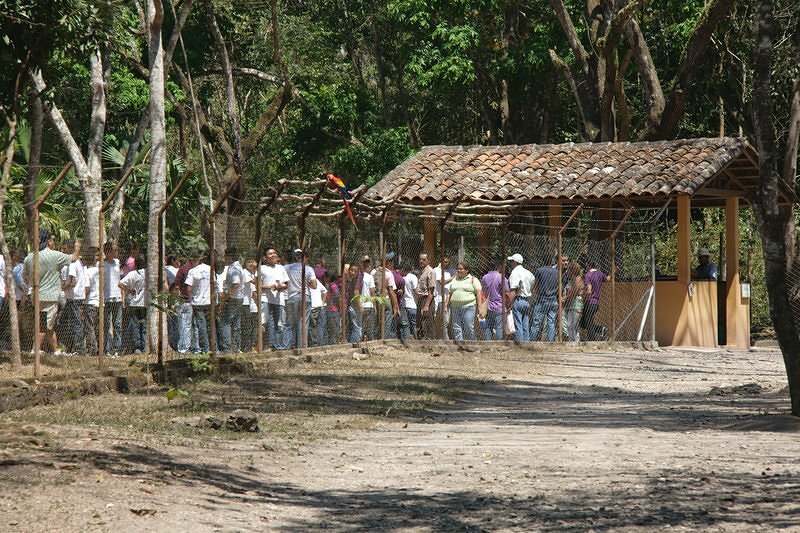 Though it is possible to cross directly from El Salvador, it requires a few more hours in a chicken bus. It’s so common for people to enter Honduras for the sole purpose of visiting Copan Ruinas from Guatemala that they have devised a special exit/entry visa system to accommodate exactly that, reducing your border crossing fees. This works well so long as you enter and exit the country from the same border crossing and don’t plan to visit anywhere else while you are in Honduras. The ruins themselves can be divided into 3 parts, the entrance which does not require any tickets to enter, has a large grassy picnic area and a self guided nature trail (with signs in English and Spanish) that takes about 30 minutes to complete. Also in the entrance are the cages that are being used to help re-introduce the Scarlet Macaw to the forest. 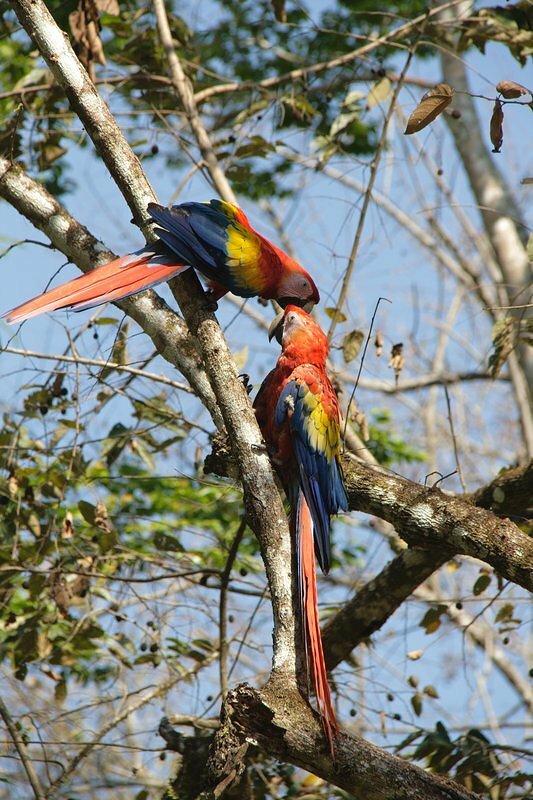 These photogenic birds are easy to spot, and numerous. I wonder what secrets they are telling. Next comes the main area. Located just past the entrance it lies behind a fenced in gate. To enter, you require a ticket, valued at 285 Lempiras ($15 USD) per person with an optional ticket to view the tunnels, created by archaeologists, for the same amount again. We chose not to view the tunnels, as the price seemed a bit too steep for us. The main area has been beautifully restored, and consists of a series of Stella, and Temple buildings spread across 1 sq. km. 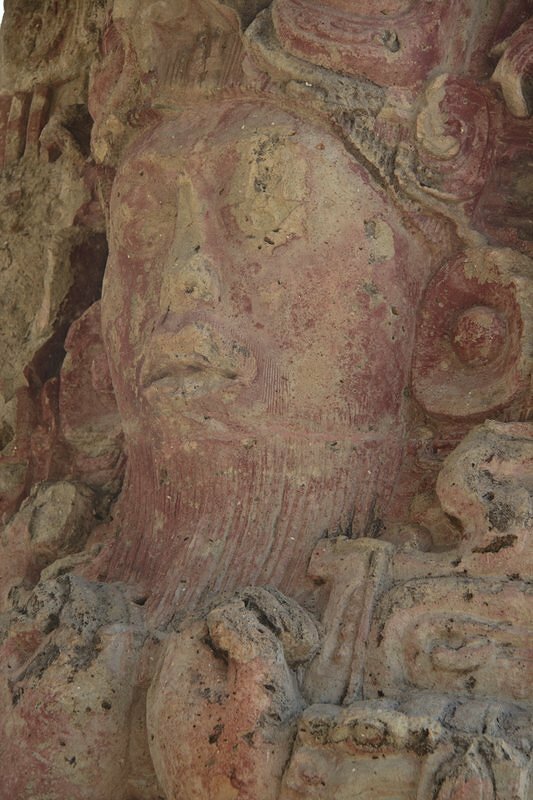 Take your time looking around, the detail in the carvings is the best we’ve seen anywhere. Truly amazing. It took us about three hours of wandering around before we’d had a cursory glance over everything. We arrived in the main area as soon as the gates opened, 8:00 AM, and had the place almost to ourselves. By the time we left near 11:00 AM several school buses had arrived on site and there was a significant amount of people pouring in. The staff let us know that this is pretty typical and advised us to avoid the park between 11:30 AM and 2:30 PM if we wished to avoid the crowds. The last section of ruins that we visited were located 2km past the main entrance along the same road leading from the town. 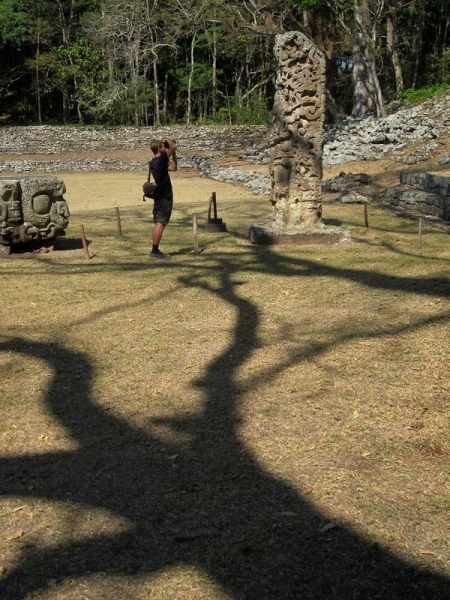 These ruins were also restored, and consisted of the residential buildings that belonged to the Mayan Elite. In contrast to the main area we were completely alone here even during the peak visiting hours, with the exception of the gatekeeper who decided to take on the role of unofficial tour guide – partly for hopes of a tip and partly out of boredom. The Sepulturas, as this section of the ruins is erroneously called, requires your entry ticket from the main area to visit. It’s quite large with a simple trail along the river connecting the various buildings. The lack of other tourists made this a perfect place to sit down and ponder the failed civilization of the ancients (if the Mayans can really be called ancient). We also brought our books with us. We set about reading them until the park closed at 4:00pm. In addition to what we saw, there is also a Museum that houses much of the original carvings and pottery found at the ruin site (most of the carvings and statues you see outside in the ruins today are replicas). Like the tunnels, we found the additional museum fees of $7 USD a bit too much to swallow, and decided to pass. Seeing the replicas on the buildings was enough for us. So, how do the ruins stack up? The carvings are the best we’ve seen. The buildings were about average.